Edit your provider's current settings including hours and shift request, sequence of shifts, and shift preferences. These settings will apply to future schedules. In the 'Summary' screen within a version, edit hours and shift request, shift sequences for providers. These changes will only apply to the current version. The Providers Information displays all 'Hours & Shifts', 'Shift Sequences', and 'Shift Preferences' requests specific to an individual provider. Most important to you are probably the usual number of hours and shifts requested by the provider for each schedule, the number of days in a row the provider prefers to work (referred to as Shifts in a row on the screen), and shifts the provider is unable to work or for which the provider has special 'Shift Preferences'. When the Scheduler creates a schedule it attempts to match the requested values as closely as possible for each provider. The task of entering these data values for each provider is greatly simplified by use of a 'template' and the 'Copy Provider' feature. The Scheduler can produce schedules even if all you do is simply enter the names of your providers. The menu displays the 'Hours & Shifts', 'Shift Sequences', and 'Shift Preferences', 'Show All', and 'Copy Provider' options. 1. Hours & Shifts: How many hours and shifts should each provider work in each schedule? You may enter requests for 'Total Hours' or 'Total Shifts', and specific numbers of shifts in up to three selected summary categories. For example, you might want to configure the Scheduler to accept scheduling requests for specific numbers of night, weekend and evening shifts worked in each schedule by each of your providers. 2. Shift Sequences: Specify sequences of shifts preferred by each provider. The number of shifts worked in a row, nights (or other category you choose from the drop down menu) worked in a row, and whether the provider wants to either work the entire weekend or be off for the entire weekend (or doesn't care) can be defined. If you configure more than one 'Relation model', select which one is used for each provider. 3. Shift Preferences: In the shift preferences row starting with the 'Can't do shifts' entry area, let the Scheduler know if there are any types of shifts that an individual provider cannot work, or ones she/he prefers or dislikes working. (For example, providers who work only in a fast track area may not be able to work other shifts.) If you defined multiple sites, you can easily click 'Canâ€™t do shifts' for an entire site, rather than for each shift in it. 4. Show All: Click this button to change the display to show the same configuration options as the current entry area, but for all providers. 5. Copy Provider: A window displays three options. Select a provider from the 'Provider to copy from' menu and then choose 'Settings to copy' for 'Workloads', 'Shift preferences', and 'Shift sequences' from one provider or multiple using the 'Providers to copy to' option. This assists you with copying the same or specific settings from one provider to another provider or multiple within the 'Providers Information' screen. The majority of the 'Providers Information' entry form screen is occupied by the entry form itself. 7.Shift high priority category- Select one of your 'Categories' and this 'Category' will be considered as a high priority before scheduling the rest of the shifts during automation according to the importance of having an exact match between the number of shifts requested and the number of shifts actually scheduled. 8.Shift med priority - Select one of your 'Categories' and this 'Category' will be considered as a medium priority before scheduling the rest of the shifts during automation according to the importance of having an exact match between the number of shifts requested and the number of shifts actually scheduled. 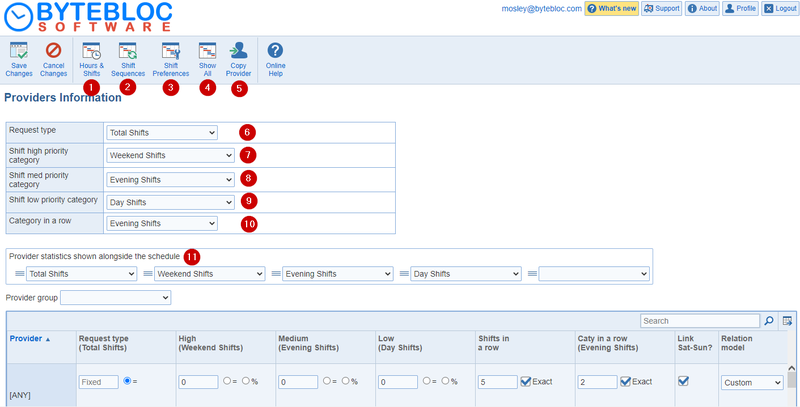 9.Shift low priority category - Select one of your 'Categories' and this 'Category' will be considered as a low priority before scheduling the rest of the shifts during automation according to the importance of having an exact match between the number of shifts requested and the number of shifts actually scheduled. 10.Category in a row Some providers want to work several 'Shifts in a row' for most shifts but not for certain other shifts, such as nights or longer length shifts. Initially set to read 'None' in a row, this text field allows a secondary 'Category in a row' designation to be changed if desired. Provider: The 'Provider' names will be listed in alphabetical order. Select the triangle icon to filter non-alphabetical order. Request type: You have the option to choose = or enter a number. High: You have the option to choose from a number, = or %. Med: You have the option to choose from a number, = or %. Low priority: You have the option to choose from a number, = or %. Shifts in a row: Any number from one to nine may be entered. 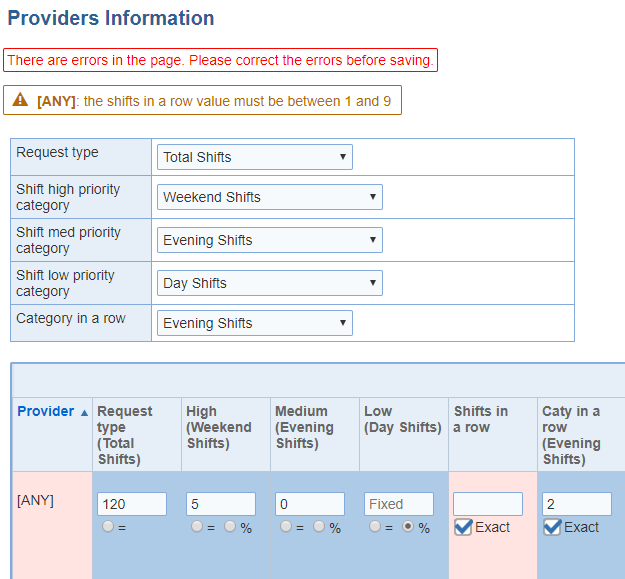 Select the 'Exact' option indicating that the provider wants to work as close to that number of shifts in a row as possible. Use the Exact option accordingly, as it limits schedule flexibility and prolongs scheduling time. The Scheduler does not set a minimum number of days in a row for each provider to work, though it does try to avoid isolated shifts. If necessary, the Scheduler schedules a provider for one more day in a row than the requested upper limit in order to avoid scheduling another provider for shifts having a Dislike preference relationship (as indicated by your entries in the 'Shift Relations' screen). It will also schedule a provider for an additional day in a row if it is the only way to schedule a provider for their requested number of hours. The Scheduler will schedule a provider for as many shifts in a row as necessary in order to avoid leaving a shift unscheduled, but only after attempting to schedule that shift by all other means at its disposal. By default 'Shifts in a row' displays 5, but feel free to change this to suit the usual value for your group. Caty in a row: Any number from one to nine may be entered. Link Sat-Sun? : Some providers may want to work the whole weekend if they are working it at all. Select the 'Link Sat-Sun' check box for each provider who wants to work for entire weekends or be off for entire weekends. Use this option only if needed, as it limits schedule flexibility and can prolong scheduling time. The 'Link Sat-Sun' check box allows you to indicate if a provider prefers to work shifts on both Saturday and Sunday if the provider has to work a weekend shift, or have the entire weekend off, rather than working just one day of the weekend. Make sure the check box is not checked if this is not important to the current provider (i.e., if working only one weekend day and being off for the other is acceptable). The automated scheduling uses option 'Link Sat-Sun' as a preference rather than as an absolute constraint. Consequently, the assignments made by the automated scheduling may result in providers assigned to only one of Saturday and Sunday in a given week based on the influence of other dependencies such as 'Need off', 'Can't do', 'Conflict', and 'Prohibit' constraints, and 'Workload' targets. Example: In this case, every provider has the 'Link Sat-Sun' option selected. This creates a very strong linkage of assignments between the 2 weekend days which cannot be satisfied for all providers given the other constraints defined for the schedule. Relation model: Indicates the 'Relation model' (of the fifteen that can be created in the 'Shift Relations' screen) used by the current provider. To change the 'Relation model' selected for the current provider, click on the 'Relation model' entry drop down menu. A list appears which contains all 'Relation models' that have already been created; simply select the model preferred by the current provider. Can't do shifts: When creating a schedule, the Scheduler does not schedule a provider for any shifts that you have identified as 'Can't do shifts', and a message will display in the 'Notifications' section. The schedule initially displays a blank as the standard entry in the 'Can't do shifts' preference. To enter 'Can't do shifts' for a provider, click on 'Edit Provider' > 'Shift preferences' section. A listing of all of the currently active shifts defined for your schedule is displayed, with an additional Weekends entry added at the bottom. The order in which the shifts are listed is ordered based on the current 'Display Settings' for the location. If you divided your current scheduling location int 'sites' in the 'Admin' tab > 'Edit Location' > 'Schedule' tab, the created site names are also available for selection. Check the appropriate 'Can't do shifts', 'Sites' or 'Weekend' option for that provider. Preferred shifts: Shifts in this section that would normally be considered as Okay by 'shift relations' are instead regarded as preferred, increasing the chance that they will be scheduled. High preferred shifts: Shifts in this section that would normally be considered as Okay or Dislike by 'shift relations' are instead regarded as preferred, increasing the chance that they will be scheduled. Dislike shifts: Shifts in this section that would normally be considered as Okay or Prefer by 'shift relations' are instead regarded as disliked, decreasing the chance that they will be scheduled. High dislike shifts: Shifts in this section that would normally be considered as Okay or Prefer by 'shift relations' are instead regarded as highly disliked, decreasing the chance that they will be scheduled. Note: Specifics related errors in the page are now listed at the top of the page and the cells in the table with an error are highlighted.